We all know Patrick Scott Patterson suffers from a lying illness of Compulsive/Pathological Lying the WORST combination for a liar, that Doctors cannot even figure out why. As of Late Patterson is looking to make History in gaming being the FIRST gamer ever to lose over 600 World records and holding 738 total scores, at the moment he stands at 139 remaining with a Max of 5 left when all gone, like weak Glass Joe max 42 ko's yet, claimed he never cared about scores and claims to beaten MTPO with no damage, doesn't even have a Fastest Completion score, calls them TAPE fillers, yet played for 14 hrs On Lode Runner on Atari 400/800. Hey Patrick were your tapes set on SP? if you even know what that is, we know you care Patrick, people send us the PRIVATE conversations you have, we know you told cat on and off Facebook, we saw the conversations with you and Lonnie Mcdonald, and of course your cries to John Salter for bringing in William Rosa in, to take down your beloved Mr. Do's Castle, which you clearly are aware of but dismiss that you never look, and even when CONFRONTED you lie to a person you call a pal and friend. Patrick Scott Patterson Nor can I... which sort of shows how small it probably was in the first place. But you are one of.... four people I can say have done the same. It'd be six, but two who did man up and call me once later regressed into his own stuff again and eventually crosses lines nobody should come back from. I really think that if more would have just picked up the phone early on, I'd look back on things with them like I am with you now..... with zero idea what the hell we were even at odds over in the first place. John Salter Not really calling me on anything. I was friends with Bill before any of this nonsense started with him. He didn't even know you or Scott existed when he first came to the arcade. I'm friends with a few peeps who are weirdly obsessed with PSP, but I'm real life friends with Bill. We hang out every week. I tell him, just like I comment on Scott's posts. The wacky obsession with Scott's every move is ridiculous, and I'm not a fan. But both Scott and Bill are grown men and live their own lives. I'm can't save the world. I have a wife, 2 kids (one who just had open heart surgery and one on her way to college), a new full time job, an arcade business thats growing and a house to attend to. I deal in real life, not online wars. I'll leave that to you guys. If that doesn't fit how you think I should live my life. Too bad. I stick up for both of you ALL THE TIME. Maybe both side should be thankfull there's someone around here with a level head. This is the most ridiculous situation I've been in the middle of in my entire life. Both side acting like a bunch of kids. Patrick Scott Patterson I go take a shower for a few minutes.... okay, I'll bite. Which Bill? Patrick Scott Patterson I have no idea who he even is. A name I've heard, nothing more. Was friends with him way before he caught the PSP flu also. Patrick Scott Patterson I don't get McEvoy's mind, but if there's some reason this Rosa guy has something to say, maybe fill me in someday. 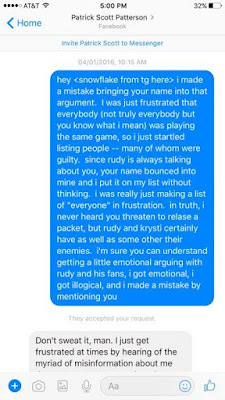 When I learned he's carrying a grudge, I looked through my e-mail and Facebook inbox history and cannot find one time where I've interacted with him. I'm certainly not acting like a child toward a person I don't know, never met that I know of, and never spoke to that I recall. John Salter The whole back and forth in general gets a bit tiring... I just want to play games and have fun. This will be my last comment on the subject. Anyone who feels I'm not a person of character please remove me from you list. If you think I'm guilty by association. Delete away. Not the way I live my life, but I won't tell you how to live yours (by "yours", I don't mean you Scott. The world in general.). Patrick Scott Patterson John Salter - Understood, other than the remark of a back and forth with a person I don't and have never interacted with. Hence part of the "problem" here. I don't know who this Rosa person is. Hard for there to be a back and forth. Totally one sided. REPLY - YET here is a PERSONAL CONVERSATION UNEDITED of you speaking to William Rosa, proving once again you are a LIAR and not to be trusted and even more so, should be like Kathy Griffen, who is NO longer being booked for gaming gigs. 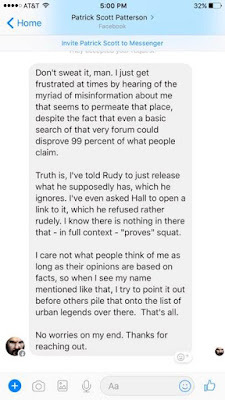 now I know Patrick you will cry foul with a quick 16 page pity post about this saying the conversation is FAKE!!!! See Patrick this is WHY you will never LIVE IN LA, why you are in the same spot you always been, why you have 100s if not 1000s against you, because you are a LYING FRAUD!!!!! Clearly you know who Rosa is and you spoke to him!!!!! what you gonna say ummmm I forgot???? Big things are headed to TG in Esports and Gaming overall, and you once wanted to be a PART of and when the TIME comes, you will beg to be part of it and NOBODY will take you serious, after bashing communities and belittling scores and having 5 LEFT of your 738 you never cared about!!!!! 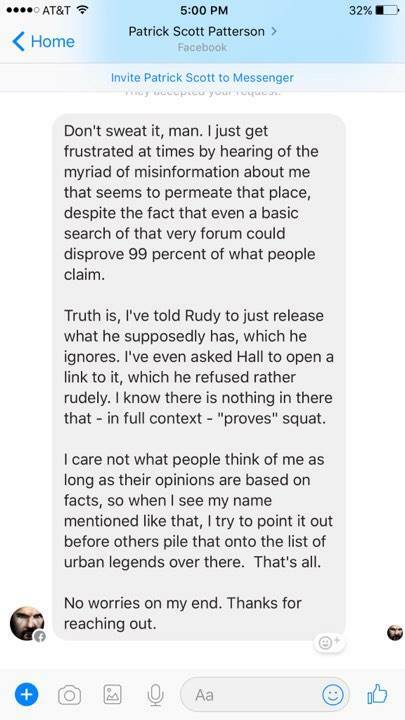 Rudy is SAG you are NOT! Just wait till you run into Jace at E3, and his Esports stuff you will bending over and foaming at the mouth for attention like a casting couch girl!!! !